1 pair of 5" combination half round/cutter jewellery pliers with no teeth. 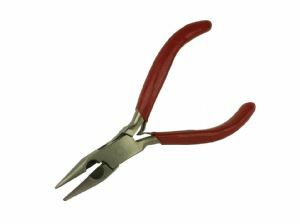 The cutter is located below the tips, making it really easy for you to snip the wire as you are using it. The stainless steel jaws are smooth with a highly polished ‘mirror’ finish so they will not scratch or spoil soft metals. These pliers feature a double leaf spring.